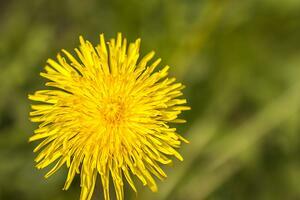 Have you ever marveled at a dandelion that forced its way through an asphalt road to sunshine? Or have you wondered how a Venus fly trap knows when to snap its jaws shut to capture its prey? Or how that pesky sedgegrass in your lawn seems to come back in greater numbers in the face of herbicides and hand pulling? Plants, including crop plants, are constantly responding to their senses. They can see, touch, smell, taste and sense water, food and predators—and they can remember. Of course, they don’t do all of this exactly the way a human does, but they do respond to messages they receive from the world around them to survive, thrive and extend their family through reproduction—much the way we humans do. This is a pretty stimulating idea – that plants are actually sentient beings responding to stimuli in a purposeful manner. The idea is nicely illustrated in the PBS series Nature, in an episode entitled “What Plants Talk About.” The program shows examples of plants demonstrating apparently “purposeful” behavior and communicating with each other as well as with potential friends and foes. More recently, scientists convened to discuss plant behavior in July 2014 at the “Biostimulants and Plant Growth” meeting in Raleigh, North Carolina. They were interested in the use of a variety of naturally-derived products—in both in agricultural and horticultural applications—to signal plants through bioactive chemical messages to improve their growth, health and nutritional value. These biostimulant products include humic and fulvic acids, seaweed extracts, protein hydrolysates, amino acids and microbial inoculants. Typically, such products are organically complex and are not completely characterized biochemically. This has meant that their positive impact on horticulture and agricultural production has been traditionally viewed with skepticism by many scientists. However, one of the presentations at the conference offered a “reality check” as to whether these types of products have positive effects on plants. The presentation was based on a scientific review article by Dr. Joseph Kloepper of Auburn University, his PhD student Pamela Calvo and their colleague Agricultural Uses of Biostimulants” in the May 2014 issue of the journal Plant and Soil. We are just beginning to comprehend the significant potential of biostimulants as a way to communicate with plants – essentially “tipping them off” as to how to positively adjust to the environmental and biotic challenges typical of agricultural systems. I, along with other contributors, will further explore this fascinating area in a series of future posts. Microbial communities in the soil are highly complex and interactive, but the scientific community has only a partial understanding of the functions, or even the identity, of the vast majority of these microorganisms. Even the better-studied ones offer us only glimpses of their functions and capabilities. Thus, we face a significant challenge in trying to define meaningful measurements for microbial functions, especially those that we can relate directly to sustainable crop productivity. Yet, as with any system, our ability to influence or manage microbial functions must be guided by quantifiable indicators. Earlier in this blog series, I described a “cycle” of responses to various impacts or stresses in a microbial system. Within that context, it might be useful to illustrate a couple of examples of measurement approaches – one of which would be aimed at managing a negative (or deleterious) effect on the system and the other a beneficial effect. In either case, the measurement approach is aimed at developing management strategies to improve productivity through a positive shift in the cycle of the system. 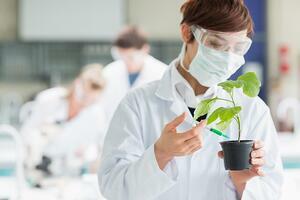 The first example involves management of a targeted soil-borne plant pathogen. The measurement approach would be to quantify the population of the pathogen, and then relate that quantified level to an estimate of disease severity and subsequent impact on crop yield. Management strategies would then be developed to decrease the pathogen population and maintain it at a level well below that at which the pathogen would be considered to be of economic concern. In this example, the initial population measurement represents an ambient level prior to taking action for disease control. A stress or impact on the microbial community is introduced by the application of a chemical or biological disease-control product aimed at the target pathogen, rotation to non-host crops or resistant varieties, employment of cultural practices that disfavor the pathogen, or some combination of these actions. Any resistance to a reduction in the pathogen population would be influenced by the forms of infective propagules in the soil, protection within crop residues, the type and amount of control material used, the length of time required for the control material to come into contact with the pathogen and function, and a variety of physical, chemical and environmental factors that may alter efficacy of the control material or disease development. The desired response of the system would be to reduce and hold the pathogen population at a level that would minimize disease. If our measurements are appropriate, then we should be able to quantify the effects of our strategies through each stage of the cycle, with the final success indicator being that of increased crop yield. Obviously, our goal should include maintaining the system beyond the individual crop season. Our management practices should be geared toward preventing the restoration of the pathogen population and maintaining the resilience of the microbial system. 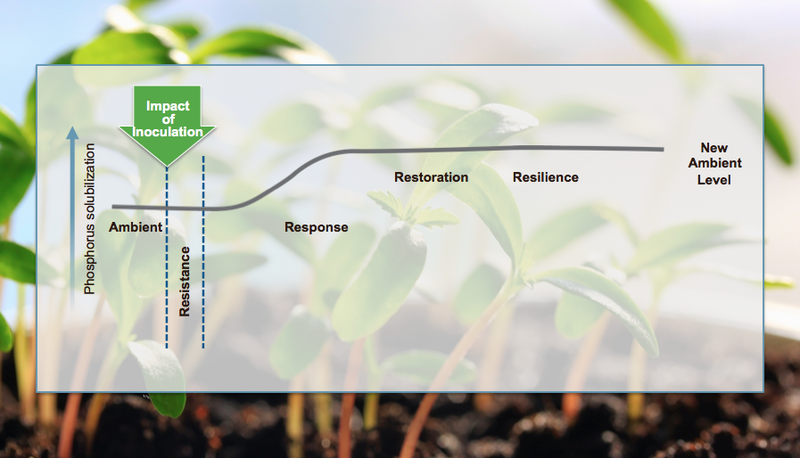 That resilience would be highly dependent on the establishment and maintenance of a microbial community that helped to prevent disease and promote crop productivity. The second example calls for management strategies to increase the presence and activity of microorganisms that provide beneficial functions to the system. An example of such a function might be phosphorus solubilization – that is, the array of activities that support increased phosphorus availability and uptake by the crop. In this case, our management strategies would be quite different from the plant pathogen example, but with the same goal of increased crop productivity. Thus, the strategy would be to promote the introduction and/or functioning of phosphate-solubilizing microorganisms. The ambient measurements could consist of quantifying particular phosphorus-solubilizing bacteria, measuring phosphatase enzyme activity, using a variety of molecular tools to directly or indirectly assess the microbial community capable of phosphorus mineralization, or simply measuring changes in plant-available soil phosphorus. The impact event, as one approach or management strategy, could consist of the introduction of phosphorus-solubilizing microorganisms. Here, the desired outcome would be to obtain minimal resistance to the establishment of the introduced microorganism and observe a measurable increase in the phosphorus solubilization response. 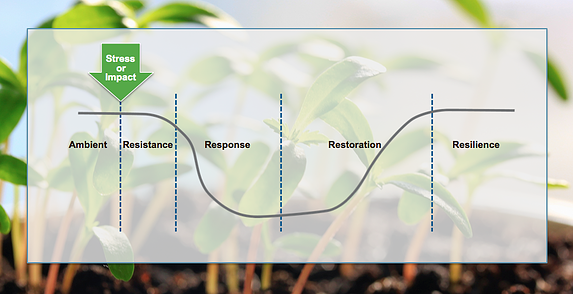 As indicated in the diagram below, the management strategies employed would be directed at minimizing major fluctuations in the restoration or resilience stages so that the “new” ambient level for phosphorus solubilization would be higher than previous measurements. The cycle management strategies would also have to take into account that it is difficult to alter soil phosphorus chemistry and recognize the importance of preventing adverse environmental effects due to the off-site movement of phosphorus. Example of an ideal “impact cycle” due to inoculation with a phosphorus-solubilizing bacterium and potential for increased phosphorus availability to a crop. From the above examples of measurements, we can see that there are many considerations and management strategies that come into play depending on the microbial system “cycles” and the desired objectives. In spite of the challenges, there are literally thousands of microbial functions in the soil that have the potential for management to benefit crops. In the next and final blog entry in this series, I will discuss some reasons why agricultural productivity is, in fact, dependent upon microbial technology and identify some of the important benefits those technologies can provide. In agricultural soils, the impact of farming on various species within microbial communities and their functioning may be beneficial or harmful. Many published studies have addressed this subject, comparing conventional, sustainable, organic, or a mixture of practices characteristic of these systems. The results clearly indicate that the different farming practices result in changes in microbial community composition; however, there are no clear correlations between these microbial changes and agricultural productivity. To better understand how agricultural practices impact microbial communities, it may be helpful to provide a general diagram of microbial response. Key factors to keep in mind are that this “cycle” occurs frequently during the growing season and that the starting and ending points are constantly re-adjusting with every impact. Each cycle can be broken down into stages that I describe, and define below, as ambient, resistance, response, restoration and resilience. Supplemental reading on this topic can be found in articles by Bottom et al (2006) and Griffiths and Philippont (2012). In the definitions below, a “change” may be positive or negative based on a measured parameter or set of parameters used to assess microbial community composition or function. Ambient: The status of the soil’s microbial communities prior to an impact event. Impact: An event which induces a change in the microbial community. Resistance: When little or no detectable change occurs following an impact event. Response: The negative or positive change induced as the result of an impact. Restoration: The stabilization phase where the microbial community approaches a new ambient level. Resilience: The comparison of microbial functioning and composition determined before an impact event relative to the final stabilization stage where change is no longer measurable. Thus resilience is the degree to which the microbial community absorbed the impact or stress to the system. To relate changes in soil microbial cycles to their subsequent effects on agricultural productivity, it’s necessary to decide on what, when, how and where measurements are taken. In subsequent blog posts, I’ll provide a couple of examples of measurements obtained before and after an impact event so that we can gain some perspective on how a crop may be affected as we move from the ambient to resilience stages. As previously mentioned, we can recognize stress on agricultural crops fairly easily based on poor growth, wilting or disease symptoms. However, we rarely consider stresses on the functioning of microorganisms in the soil – mostly because they can’t be easily seen, and we don’t really understand how most of these organisms function. 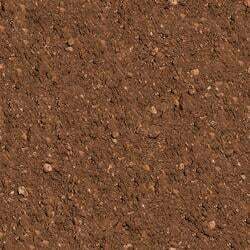 We do know that the life cycle of individual soil microorganisms is short and may be only a few hours or days for many of them. So any disturbance of the soil will have an impact on the microbes present and their functioning within the microbial community. Before we start looking at stresses to microbes, I think it will be helpful to better understand the concept of the microbial community. 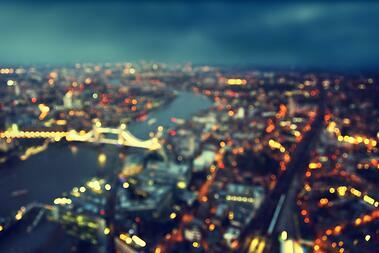 Most of us have been in an airplane at night and have seen the lights of the cities below. At a high elevation, the cities look like separate clusters of lights, but when we get lower, we can see that they are actually interconnected with roads, power lines and cell towers. There are brightly lighted areas of high activity and less-lighted areas of the countryside. This is how I envision microbial communities in the soil. There are areas of the soil where the microorganisms are very active, especially near and around plant roots – and there are areas well away from the roots or sources of nutrients where the organisms are less active. So the microbial communities can be large or small, but they are constantly interacting and communicating. Also, as with us in our individual communities, soil microorganisms that make up the microbial community have thousands of different jobs, skills and services that they perform. Stresses or impacts to the microbial community can occur with any type of soil disturbance. Even common agricultural practices such as cultivation, irrigation or fertilizer application induces a change or stress on the functioning of microbial communities to which they must adjust. This is much like a major road construction project causing you to take another route to work or slowing your ability to travel across town. In the next blog post, I will outline the various components of microbial stress response to help us understand how the microbial community may respond to these changes. Most who are involved in the agricultural industry understand that agricultural productivity is dependent on a variety of crop inputs, management practices and environmental factors that ultimately influence the quantity and quality of the crops harvested, as well as profits for the grower. In recent years, we’ve become very aware of the impact of environmental stresses due to drought, and even excessive rain, on crop yield. It has also been stressed that agricultural productivity must be considerably increased if we’re to meet the demands of an increasing population. Thus, the burden on the agricultural community is to produce more in a sustainable manner that minimizes adverse environmental affects and is minimally impacted by stress conditions. All of these present major challenges, with the ability to minimize environmental stress being the most difficult. In this blog series, I’ll discuss the various stages of stress on the soil microbial community, how that relates to agricultural sustainability and productivity, and finally, how biostimulant technologies can help to reduce the stress cycle. Stresses to crop productivity are usually thought of in terms of drought, hot or cold weather, nutrient deficiencies, pests and disease pressure and related issues. Generally, the soil’s involvement in crop stress is not considered unless issues such as compaction, poor or excessive water retention, or nutrient deficiencies become very apparent. Symptoms of crop stress are often readily observed and can occur fairly quickly during the growing season, while those of the soil may take many years to manifest themselves. Very little thought is given to the impact of stress on the soil microbial community and how that may impact crop stress and productivity. But this is a topic worthy of further discussion and discovery, which I will explore in the next post.